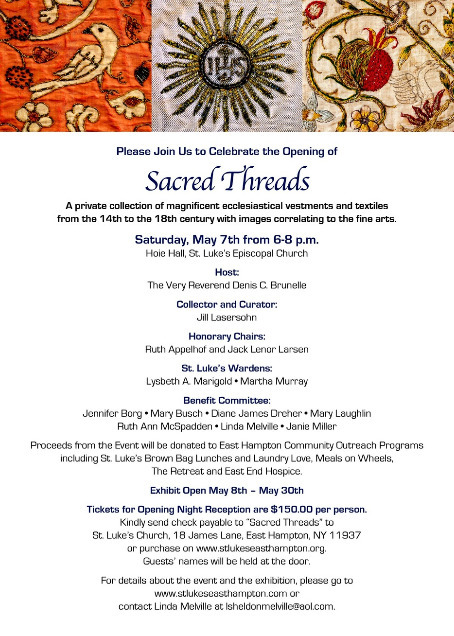 Here are the details for anyone who is within striking distance of Long Island in May. The cost of regular entrance is $20 per person. There is a reception for the opening night and the tickets for this are more expensive. I am sorry I don’t have photographs of any of the exhibits themselves. If I get hold of any I will post them. 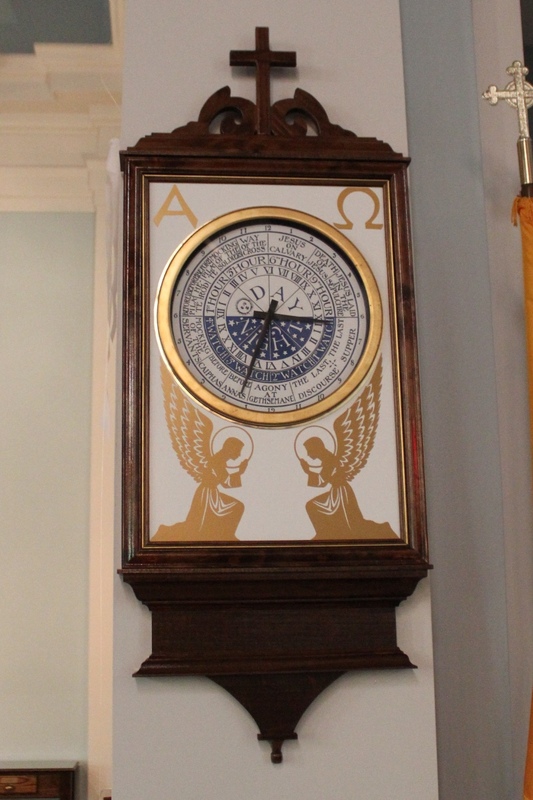 Further details are available at the website of St Luke’s Episcopal Church. A blessed Easter to you and your family! 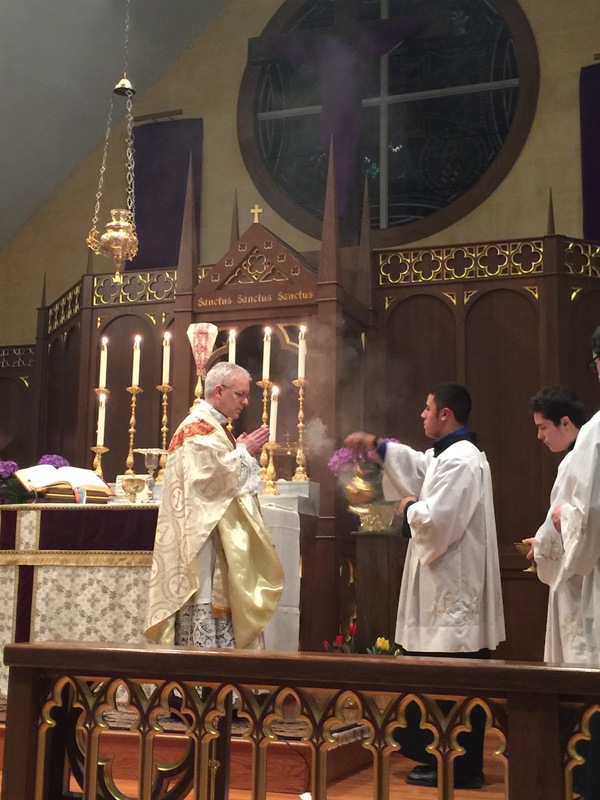 Below, we have part 2 of our Holy Thursday Photopost. 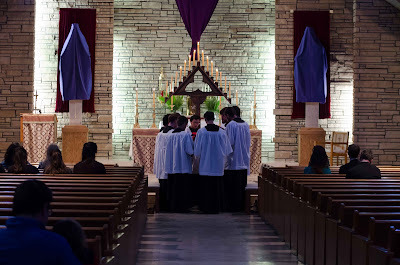 The rest of the triduum will be up in the next few days as well! 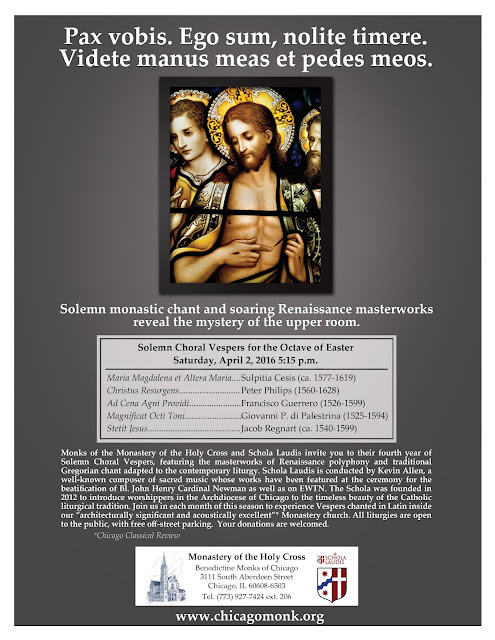 The Monastery of the Holy Cross in Chicago, a traditional Benedictine monastery of the Subiaco-Cassinese Congregation, will celebrate a special Solemn First Vespers for the Octave Day of Easter on Saturday, April 2 at 5:15 PM. Over the past decade, the choirmaster and prior, Peter Funk O.S.B., a University of Chicago-trained choral conductor and composer, has taught the monks to chant all the Ordinaries and Propers of the Mass and all the antiphons, hymns and responsories of the Office. 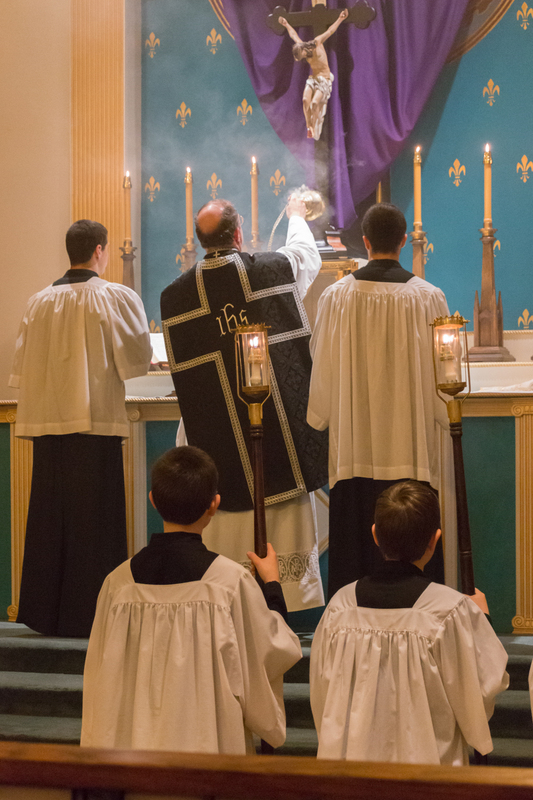 The culmination of these labors is a new Solemn Choral Vespers series, which offers perhaps the richest expression of their founding charism, to evangelize through the liturgy. 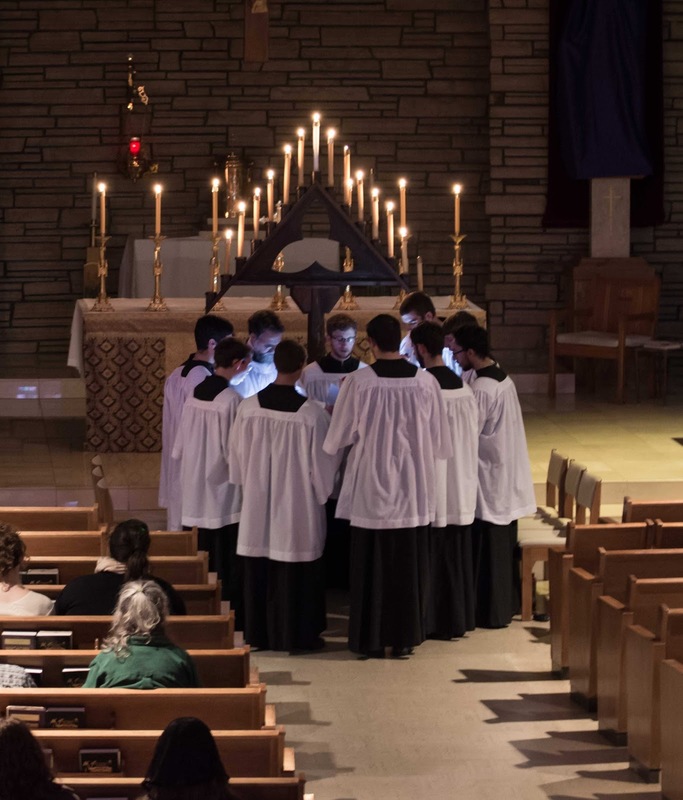 In the autumn of 2012, a generous benefactor provided the resources to found the choral group Schola Laudis, under the direction of Kevin Allen, a local conductor and composer whose name is likely familiar to many of our readers. 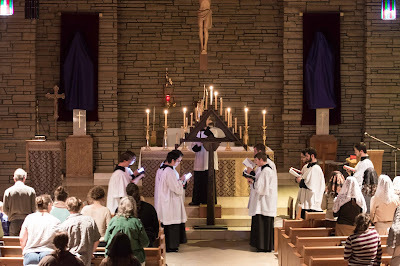 The goal of the Schola is two-fold: to enrich the liturgical life of the Monastery and the Archdiocese of Chicago by the incorporation of the masterworks of the Renaissance composers, and more generally, to introduce a broad range of people to the beauty of the Catholic liturgical tradition. The Schola always performs the glorious music of Palestrina, Byrd, Victoria, Josquin Desprez and others in its intended liturgical setting, alternating their polyphony with the monks’ Gregorian chant. 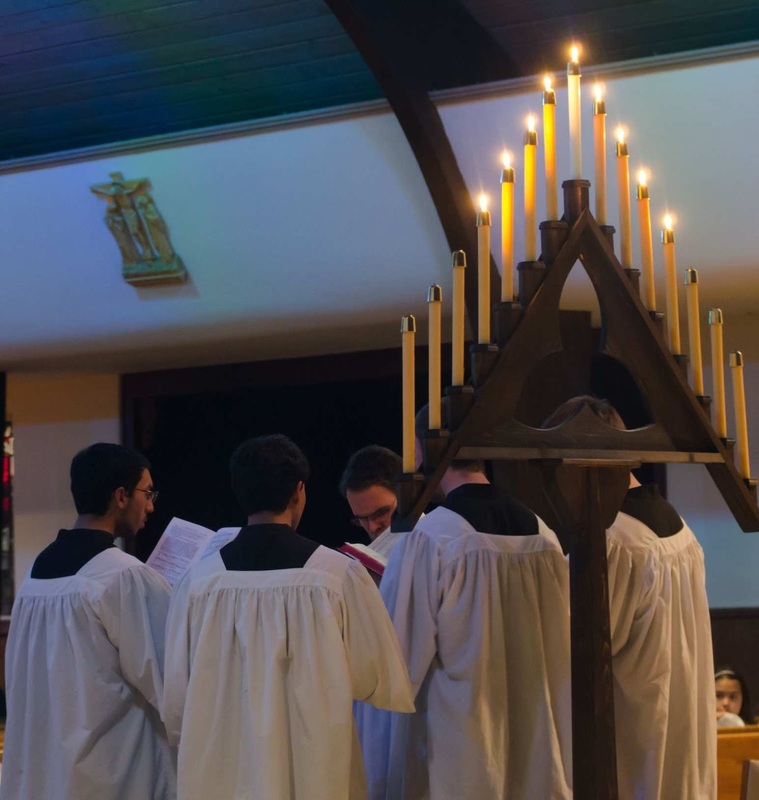 Over the past four years, Solemn Choral Vespers with Schola Laudis has become a regular part of their liturgy. 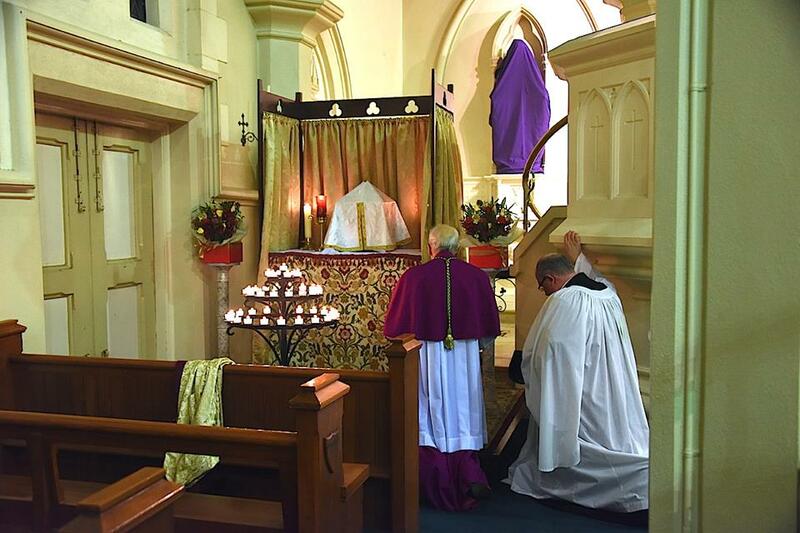 As the monks write, “We believe that this in itself can serve as a powerful witness to the wider Church. 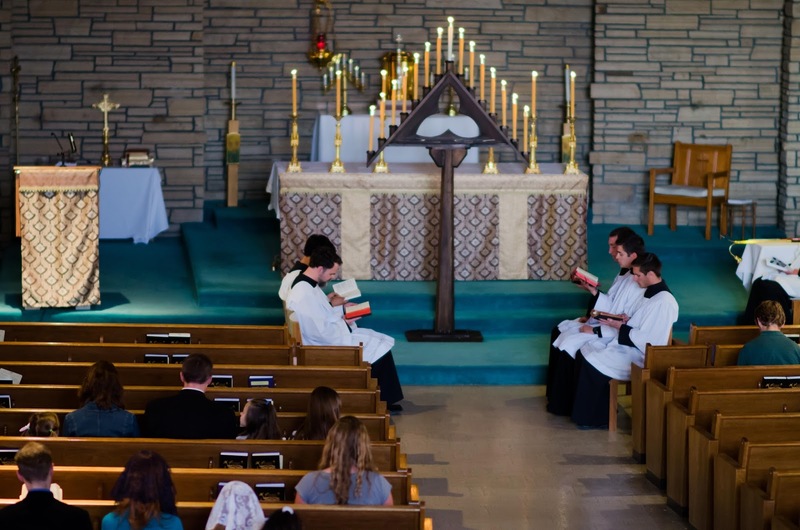 Regular liturgical prayer outside the Mass is not only possible, but desirable and beautiful, especially when offered in a rich variety of settings by some of the greatest Catholic composers. Through your website, we hope to make contact with a larger network of individuals and communities in the Northern Illinois area who are already committed to traditional Catholic liturgy but do not yet know about our Monastery or the Solemn Vespers series.” NLM is of course very glad to promote such an initiative. 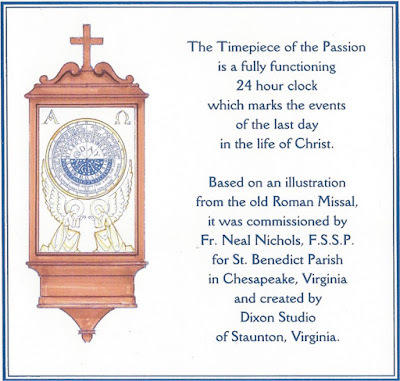 The Fraternity of St Peter’s church in Chesapeake, Virginia, St Benedict’s Parish, has a special way of marking the events of the Lord’s Passion, a 24-hour clock that counts from the Last Supper to His Burial. This was commissioned a few years ago by the pastor, Fr Neal Nichols; the design is taken from an illustration in an old hand missal, and the clock was made by Dixon Studios of Staunton, Virginia. Below the photos of the clock (one taken during the day, the other at night, showing two of its phases) are scans of both sides of a card which is placed in the pews of the church on Holy Thursday to explain it to visitors. Thanks to reader Michael Sottung for sending in these photos. A blessed Easter to all our readers! 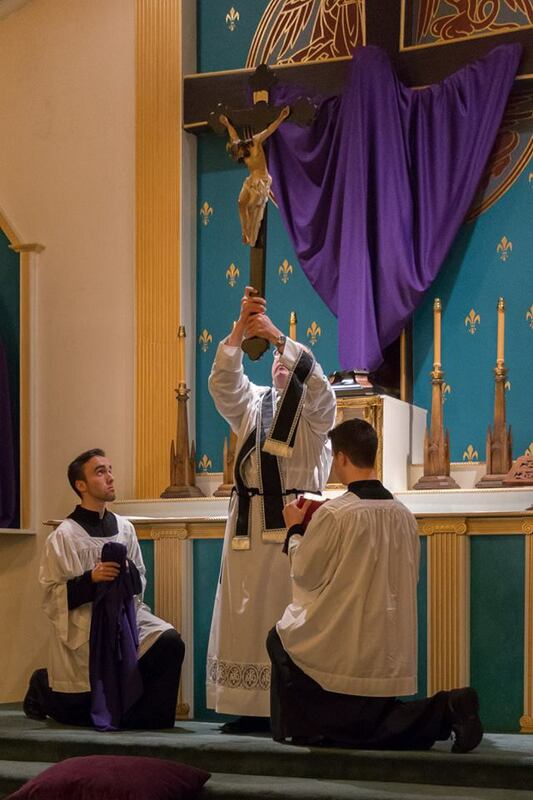 As is our annual tradition, there will be several Triduum photoposts going up over the next few days. 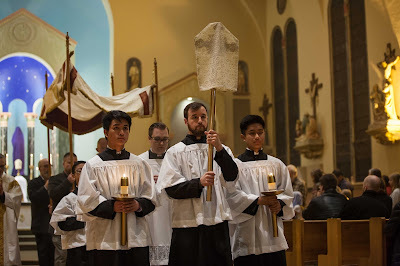 Due to an exceptional response rate, we will split the photos from each day of the Triduum into multiple posts, which will be spread out over the next few days. Don’t forget to check back every day for more liturgy photos, and as always, our thanks to all the readers who sent them in! The latest edition of the Adoremus Bulletin is now out; you can read it online here. This is a particular rich and attractively designed issue. The Adoremus Bulletin does really seem to have new vibrancy to it under the leadership of the new editorial team of Chris Carstens and Joe O'Brien. Highlights include an article about the mystagogy of the Lamb of God by editor Chris Carstens, supporting another article which analyses the Ghent altarpiece, also known as the Adoration of the Mystic Lamb, as liturgical art; that is, how do its form and content work in the context of the liturgy? 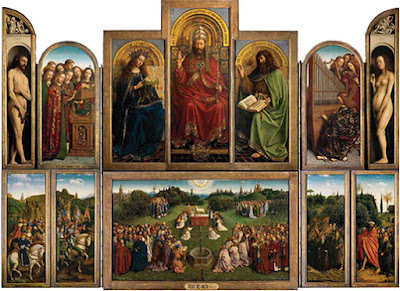 The Ghent altarpiece is the second most viewed painting in history, and the article has been prompted by the release of a book about the painting, a 15th century by the Van Eyck brothers, published by Magnificat. There is also an excellent review, written by Mr Jeremy Priest, of Uwe Michael Lang’s new book Signs of the Holy One, published by Ignatius, which is a meditation on the assertion that the non-verbal symbols associated with the liturgy are more significant than the language itself. Follow link here to read it. A Dominican Rite Solemn Mass celebrating the Saturday of Easter Octave will sung by the student friars of the Western Dominican Province on Saturday, April 2. 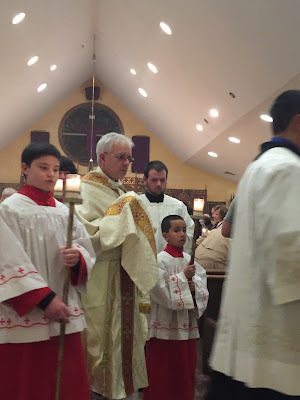 The celebrant of the Mass will be Fr. Anselm Ramelow, O.P., Asst. Prof. of Philosophy at the Dominican School of Philosophy and Theology, Bro. 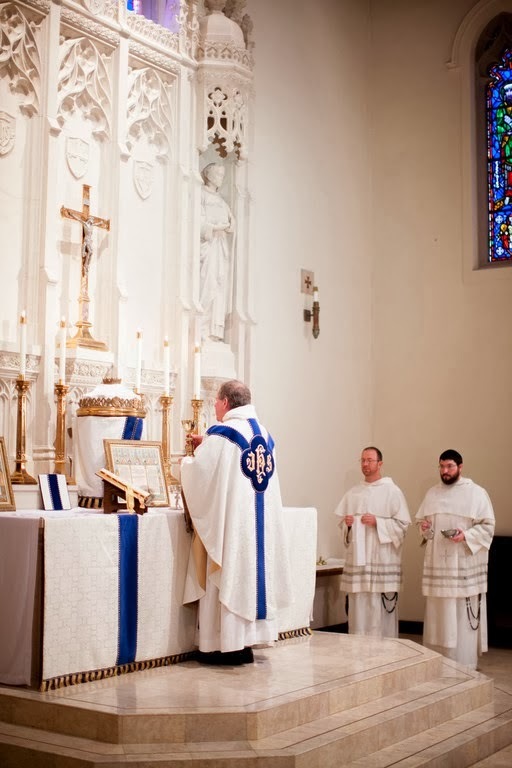 Christopher Brannan, O.P., will be the deacon, and Bro. Andrew Dominic Yang, O.P. will be subdeacon. 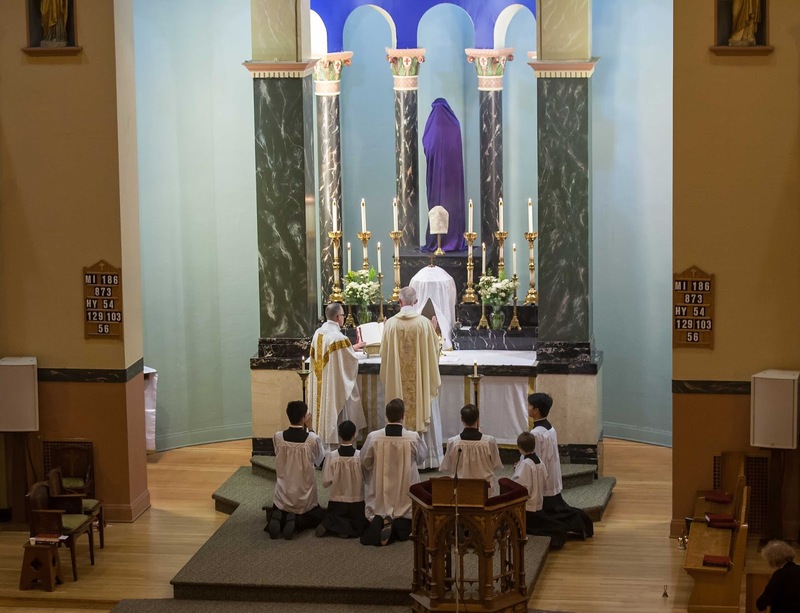 The Mass will be at Saint Albert the Great Priory, 6172 Chabot Road, Oakland CA, 94618, at 10:00 a.m. Recitation of the Marian Rosary will follow immediately. Visitors and guests are welcome; pew booklets with the text of Mass in Latin and English will be provided. There is ample parking on the street and in the priory parking lot next to the chapel. 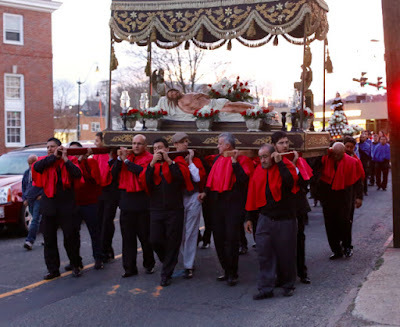 The Parish of St. Mary in Norwalk, Connecticut, marked Good Friday with the renewal of a long-standing tradition, the procession of the dead Christ through the streets with Our Lady of Sorrows following. This procession is similar to those done throughout southern Europe and Latin America, and is reminiscent of Eastern Rite liturgical uses on the night of Good Friday. This year, the procession took a new direction in many ways. 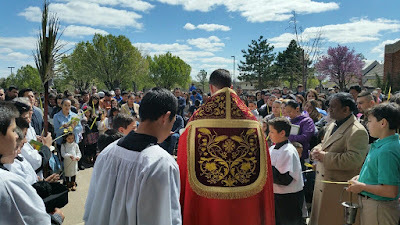 It began with prayers before the image in Spanish. Then a full church of more than 400, representing all the ethnic communities in the parish followed the procession. 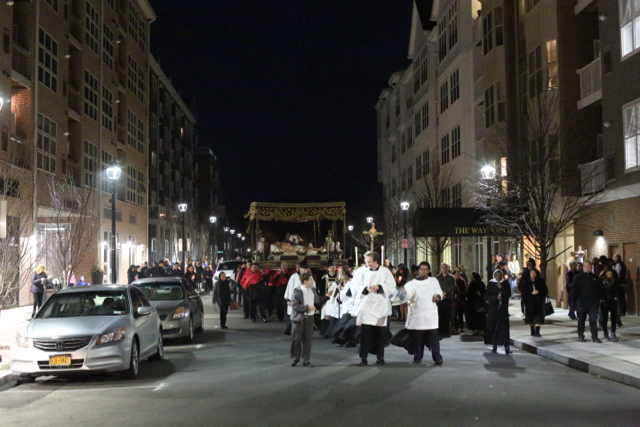 It took a new route, not only traveling along the main thoroughfare on which the church sits, but through some modern residential developments. A band set the pace for those walking, and called out the residents along the route, many of whom had never seen a religious exercise of this kind. Following the hour-long procession, the office of Compline was chanted by the Schola Cantorum of St. Mary’s Church, and the body was anointed and readied for burial, signified by covering it with a funeral pall. Hundreds of people then kept an all-night watch at the tomb until 8 the next morning. For more pictures, go to www.sthughofcluny.org. 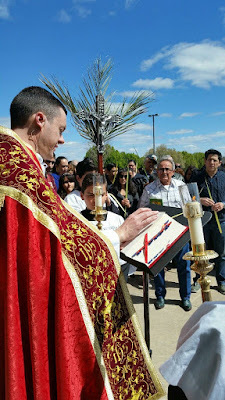 Pictures from the rest of Holy Week will be posted in the next few days. One of my research interests (and spiritual interests) over the years has been to see how St. Thomas Aquinas is a mystic in the fullest sense of the word and how, nevertheless, he came to acquire his later reputation as a rationalist. This is a big topic, but not long ago I found a little detail that struck me as fascinating — and a reason why we need good editions of medieval texts. If ever the devil is in the details, one sees this in the realm of paleography and text editing. In one of the saint’s earlier works, the commentary on Peter Lombard’s Sentences (or, in its Latin title, Scriptum super libros Sententiarum), Book IV, d. 15, q. 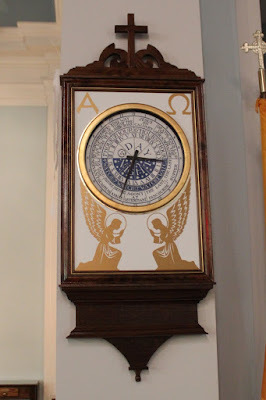 2, a. 4, qa. 1, we find Thomas talking about how to make good judgments with respect to giving alms, since there are so many particular circumstances that escape our knowledge. It’s not a bad question to ask in Lent, when we are continually reminded of the three great works of self-denial: prayer, fasting, and almsgiving. 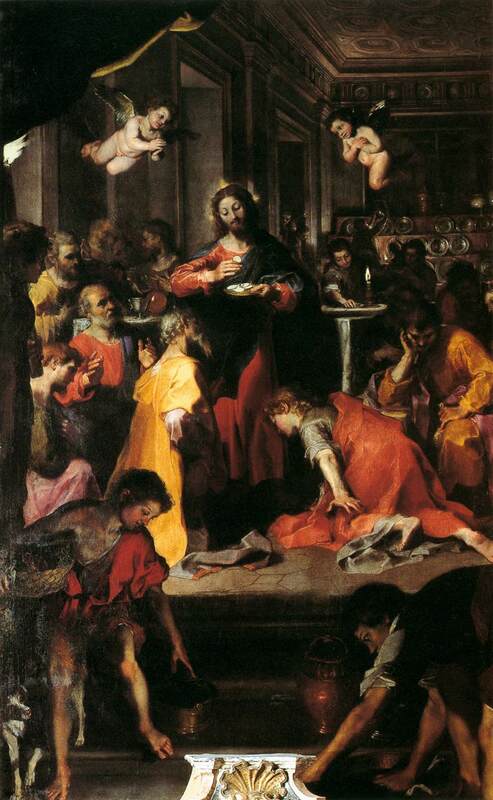 There is a modern mentality that discourages the kind of almsgiving our forefathers in the faith practiced, on the grounds that “we don’t know whether a poor man will use the money well.” While admittedly there are cases where one can judge from signs that a potential recipient of largesse is a fraud or an addict and that it would be prudent to buy him food rather than handing over money, it also has to be said that we can rarely, if ever, know for certain whether any alms we give will be well used, and that, if comprehensive evaluation of circumstances were a precondition for charitable works, none would ever get done. Still, our modern position at its best is likely to be that the almsgiver must be a man of solid good sense who, consulting his native reason, analyzes the situation in terms of probable human causes and effects, forms a rational judgment, and follows it — the very model of a modern major domo. 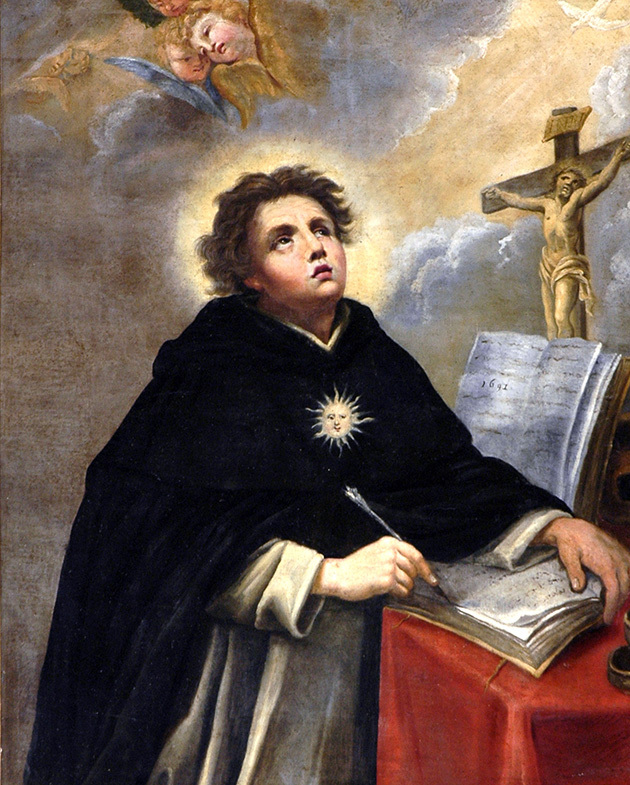 Coming back to St. Thomas, many editions print the following line in his response: Et hoc quidem sermone determinari non potest, quia de singularibus non est judicium; sed statur in hoc prudentiae arbitrio, et DISCRETIONIS, quae docet de omnibus. “And this can certainly not be determined in a word [i.e., a simple rule], for a [universal] judgment cannot be made about particulars; but the judgment to be relied upon in this is that of prudence, and of DISCRETION, which teaches about all things.” Ah, good old Whig Thomism! Later in the same passage he writes (in the faulty editions): singulares conditiones, quae attendendae sunt, sunt infinitae, et non cadunt sub arte. De his autem RATIO docet et prudentiae consilium. “Particular conditions that need to be attended to are infinite, and they do not fall within our scope. But REASON and the counsel of prudence teach us about these.” Sounds like classic Thomas, right? Always turning to reason. He might as well be the precursor of rationalism. Yet, matching the earlier text, what he actually wrote was UNCTIO: “But the unction [of the Holy Spirit] and the counsel of prudence teach us about these.” For those who know St. Thomas’s writings, it comes as no surprise that he appeals here both to the natural faculty — the counsel and judgment of prudence, which is the virtue that perfects man's practical reason — and to the supernatural gift, the anointing of the Holy Spirit that distinguishes the Christian fully alive from the potential Christian or the fallen-away Christian. Nature and grace are united in the guidance of our actions: Thomas says et, not vel or aut. These two sentences are significant if only as a reminder to us that we are meant to be supple and mobile in the hands of God, able to be prompted, motivated, steered by Him in our acts of charity, and not, as it were, slaves to our sometimes narrow rationally-constructed criteria. 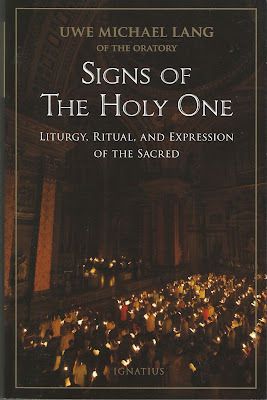 I think the same is true, mutatis mutandis, in the realm of liturgy. By our own lights there is plenty and more than enough we can learn about, evaluate, compare, critique, and propose, but in the end there is also the hidden influence of the Holy Spirit who, exercising at times a severe mercy, opens our myopic minds and our too easily satisfied hearts to the riches of the Church’s tradition, and leads us into them in ways we did not choose ahead of time — ways that surpass our understanding then and maybe even now, ways that continually challenge our reason to catch up and find some rational threads to weave together. Looking back in my life, I can see decisive moments when my encounters with the beauty of authentic Catholic worship were an unction from above rather than results of prudential decisions — times when I was not expecting to be somewhere or to do some particular thing, and yet there I was, and the gift to see with new eyes or hear with new ears was given to one unworthy of it, by the hand of God’s mysterious mercy. Times when I was blindsided, knocked over, woken up, thanks to a certain person, event, book, piece of music that had gone through my soul like a sword and had left me feeling spent and refreshed, almost as if blood-letting had occurred and had worked. 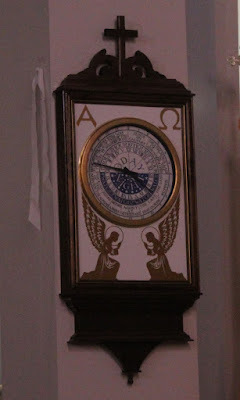 And this can certainly not be determined in a word, for a judgment cannot be made about particulars; but the judgment to be relied upon in this is that of prudence, and of the unction that teaches about all things. … Particular conditions that need to be attended to are infinite, and they do not fall within our scope. But unction and the counsel of prudence teach us about these. — I am reminded again of how that which is noblest in man’s nature, his reason, can at the same time be pathetically weak in the face of complexity and difficulty; how this much-vaunted reason is, in and of itself, incapable of securing man’s ultimate end; and how the Holy Spirit comes to our aid, the Spirit by which we learn to remember, appreciate, and utilize all that we have received from the Lord. This, then, is a little example of how careful one must be in selecting an edition of a medieval text, for different readings, especially when not carefully controlled by the editors and explained in adequate notes, can give us a very different doctrine and impression. 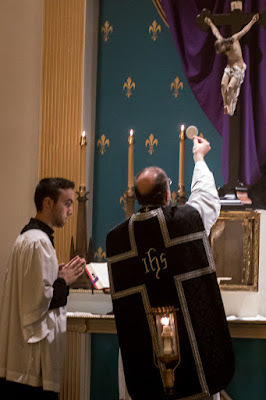 Surely, Thomas is better for his unction, and we stand to gain a new appreciation of the intimate union between God and man that is necessary for perfectly moral behavior. 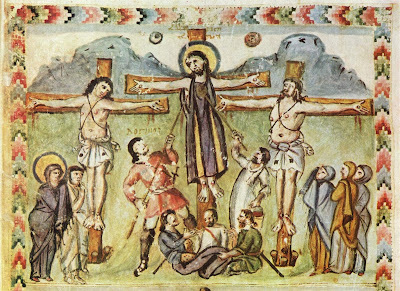 When the Lord had clothed Himself with humanity, and had suffered for the sake of the sufferer, and had been bound for the sake of the imprisoned, and had been judged for the sake of the condemned, and buried for the sake of the one who was buried, He rose up from the dead, and cried aloud with this voice: “Who is he that contends with me? Let him stand in opposition to me. 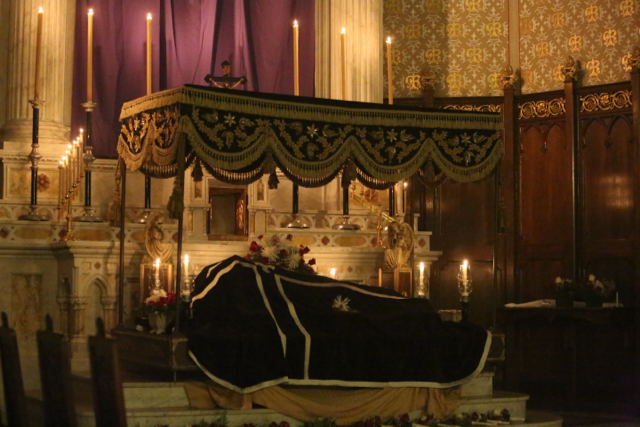 I set the condemned man free; I gave the dead man life; I raised up the one who had been entombed. Who is my opponent? I, He says, am the Christ. 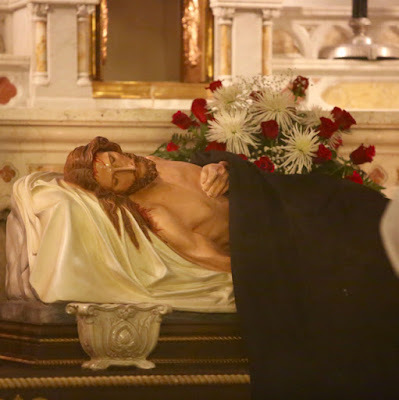 I am the one who destroyed death, and triumphed over the enemy, and trampled Hades under foot, and bound the strong one, and carried off man to the heights of heaven; I, He says, am the Christ. This is the One who made the heavens and the earth, and who in the beginning created man, who was proclaimed through the law and prophets, who became a man through the Virgin, who was hanged upon a tree, who was buried in the earth, who was resurrected from the dead, and who ascended to the heights of heaven, who sits at the right hand of the Father, who has authority to judge and to save everything, through whom the Father created everything from the beginning of the world to the end of the age. 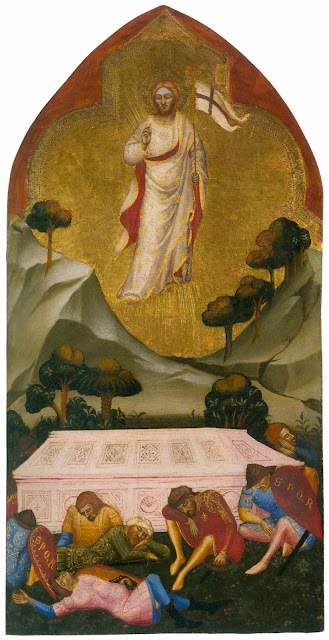 TO all our readers, to your friends and families, we wish you an Easter filled with every joy and blessing in the Risen Lord - He is truly risen! 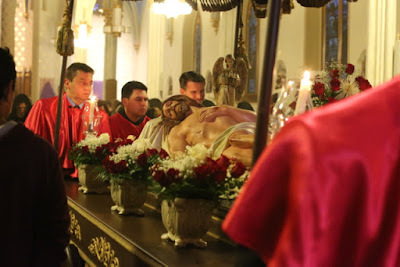 This ancient hymn was borrowed by the Byzantine Rite from the Liturgy of St James, and is sung at the Great Entrance in place of the Cherubic Hymn, when the Divine Liturgy of St Basil the Great is celebrated on the morning of Holy Saturday. 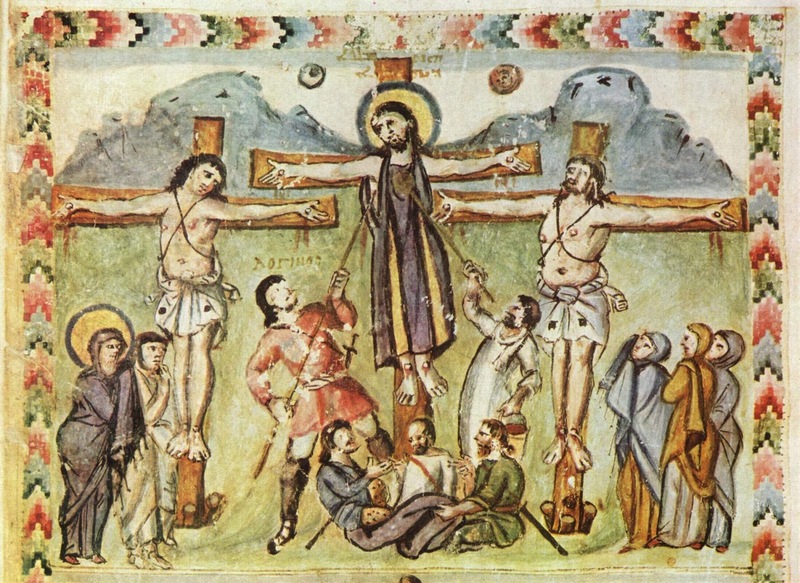 This particularly impressive Old Church Slavonic version is sung by the choir of the Sretensky Monastery in Moscow. Let all mortal flesh keep silent, and stand with fear and trembling, and in itself consider nothing of earth; for the King of kings and Lord of lords cometh forth to be sacrificed, and given as food to the believers; and there go before Him the choirs of Angels, with every dominion and power, the many-eyed Cherubim and the six-winged Seraphim, covering their faces, and crying out the hymn: Alleluia, Alleluia, Alleluia. The Old Church Slavonic text sung in the video above. Σιγησάτω πᾶσα σάρξ βροτεία, καὶ στήτω μετὰ φόβου καὶ τρόμου, καὶ μηδὲν γήϊνον ἐν ἑαυτῇ λογιζέσθω· ὁ γὰρ Βασιλεῦς τῶν βασιλευόντων καὶ Κύριος τῶν κυριευόντων προσέρχεται σφαγιασθῆναι, καὶ δοθῆναι εἰς βρῶσιν τοῖς πιστοῖς· προηγοῦνται δὲ τούτου οἱ χοροὶ τῶν Ἀγγέλων, μετὰ πάσης ἀρχῆς καὶ ἐξουσίας, τὰ πολυόμματα Χερουβίμ, καὶ τὰ ἑξαπτέρυγα Σεραφίμ, τὰς ὄψεις καλύπτοντα, καὶ βοῶντα τὸν ὕμνον· Ἀλληλούϊα, Ἀλληλούϊα, Ἀλληλούϊα. 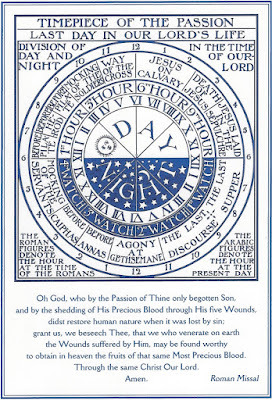 This text became familiar in the English-speaking world through the work of a mid-19th century Anglican cleric named Gerard Moultrie, whose hymn “Let All Mortal Flesh Keep Silence” is in large measure based upon it. The composer Ralph Vaughan Williams, a great collector and scholar of folk songs, set Moultrie’s version to a French carol tune known from its place of original simply as “Picardy.” It is here sung by the choir of Somerville College, Oxford. 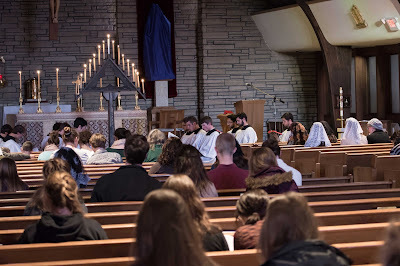 This past Wednesday night, the Schola Cantorum at Wyoming Catholic College sang the traditional Tenebrae for Maundy Thursday. It was the fifth year that we have done so, and it has been wonderful to see the growth from year to year. 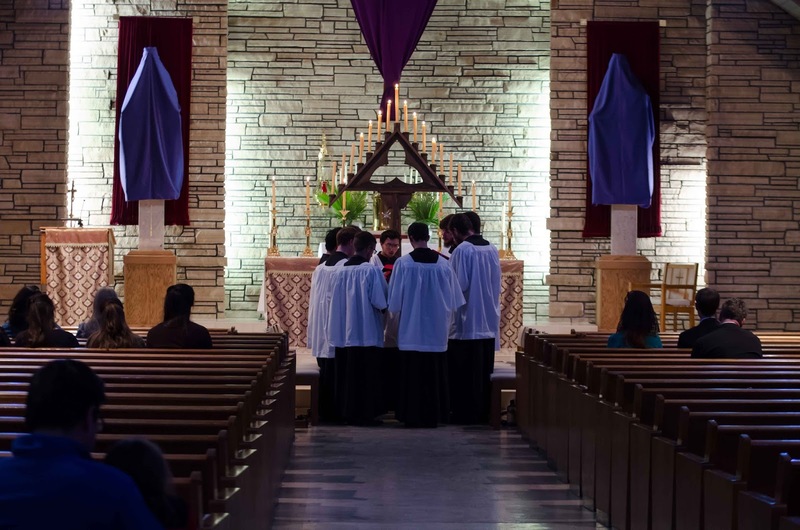 The Schola itself was twice as big in 2016 as in 2012, and the congregation about four times as large. The psalm singing has gotten better as we grow ever more accustomed to the psalm tones and texts, and the faithful in the pews, who have all the psalms in booklets, voluntarily sang along quite well. For me, this prompted a couple of heartening reflections. 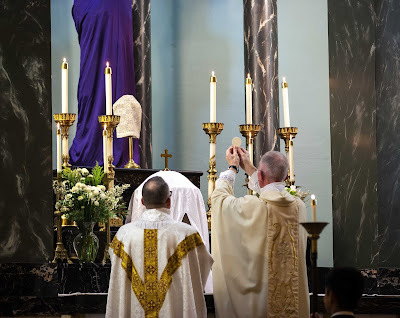 The first is simply that our Holy Mother Church gives us so many incredibly beautiful resources for entering into the mystery of Our Lord Jesus Christ -- if only we would use them! 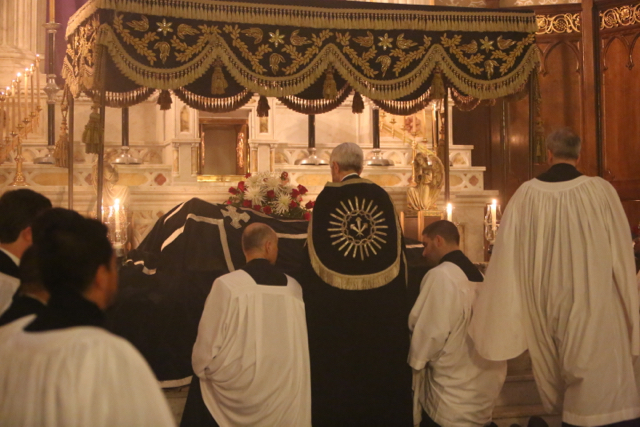 Yes, it takes time and effort and planning, as a 2 1/2 hour service of chant is not something one can create at the drop of a hat. But it is worth it in the end. The singers themselves feel that the Lord has worked in and through them. The people are edified, their hearts immersed in the Passion. The inherent sacredness and sanctifying power of these services draws in the faithful who are seeking for ways to observe the Triduum with great devotion. In short: we do not need to invent new things; we need to rediscover old things that always worked and will always work, wherever men and women are hungering for God. The second is that the best and deepest things take time to assimilate, to understand, to perfect. 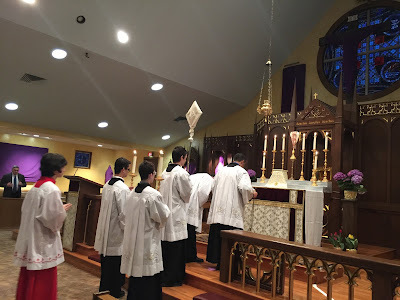 When it comes to liturgy in particular, we have to fight tooth and nail against the modern spirit of immediate gratification and quick results. 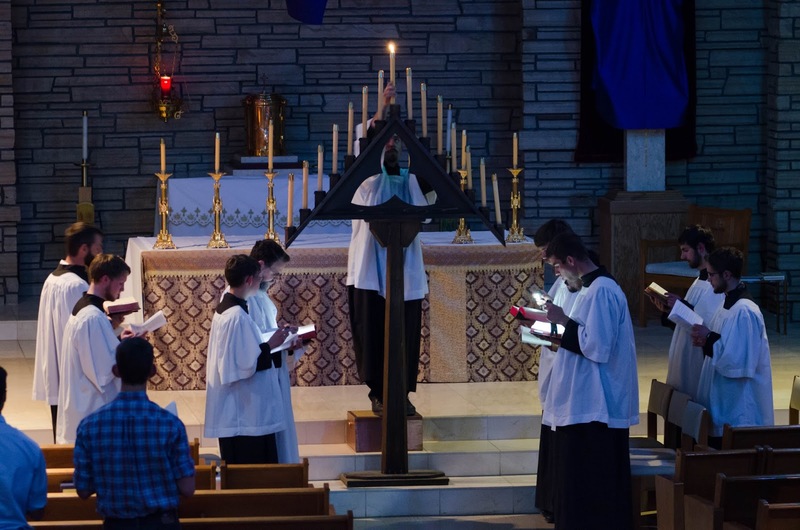 When we first did Tenebrae in 2012, we could barely chant the chants, let alone follow all the texts. The people stumbled over the psalms. It was not exactly elegant. But we did it anyhow because we saw it as a mountain worth climbing, no matter how many bruises along the way. The next year it was a little easier; one felt oriented and clued in. 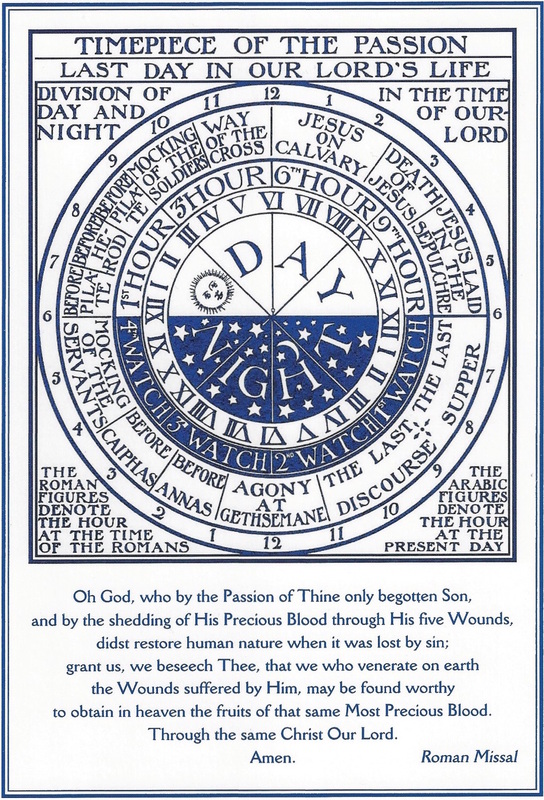 The year after, the psalm tones came more naturally and the responsories felt like old acquaintances. 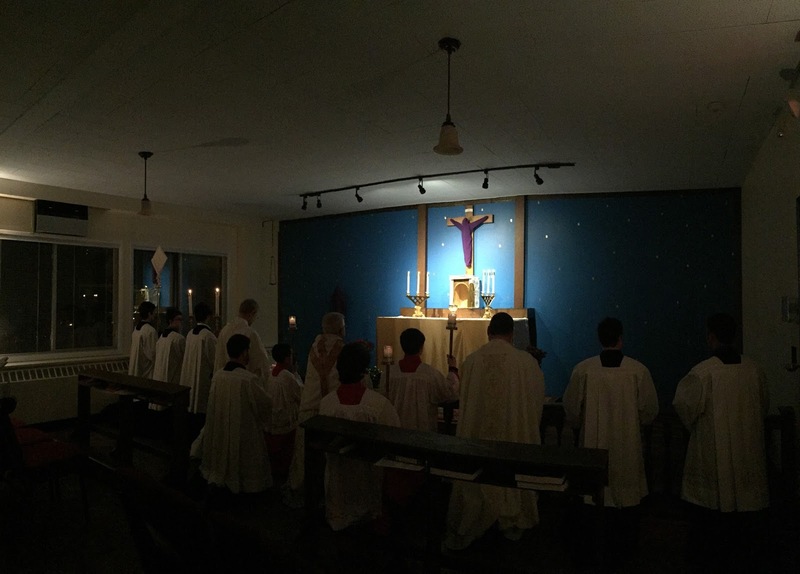 A year later, more fellows were volunteering to sing the nine readings. This year, for the first time, I was not worrying about the music and found myself drawn deeply into the meaning of the psalms and readings. It took me five years to get to that point. It's like a treasure chest containing the most exquisite treasure, but locked with formidable locks. You work at it patiently because you know that the yield is worthwhile. Nothing valuable comes cheaply. Many people, maybe even most people, value a challenge that corresponds to their dignity, calls upon all their powers, rewards their efforts. People see this in comparing Tridentine altar serving with non-Tridentine. The former is much more demanding, takes an investment of time, requires precision, thoughtfulness, and obedience to commands -- but the boys and young men go in for that, thrive on it. The latter is easy by comparison, but it can be harder to fill the ranks. 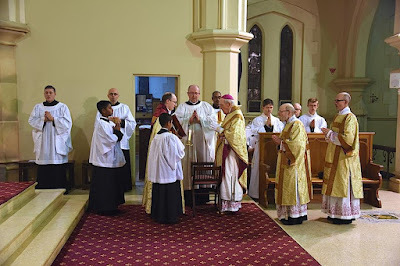 If we pay attention to the way human beings are made and what calls forth their greatest potential, we will see anew the wisdom of the Church in placing at our disposal such hard-won treasures. Tu nos, Domine, participes Filii tui, tu consortes regni tui, tu incolas Paradisi, tu Angelorum comites esse jussisti; si tamen illaesa et intemerata fide caelestis militiae sacramenta servemus. Et quid sperare de misericordia tua non possumus, qui tantum munus accepimus, ut talem tibi hostiam offerre mereamur, Corpus scilicet et Sanguinem Domini nostri Jesu Christi? Qui se pro mundi redemptione piae illi ac venerandae tradidit Passioni; qui formam sacrificii perennis instituens, hostiam se primus obtulit, et primus docuit offerre. Below, we have part 2 of our Palm Sunday photopost for 2016. As a reminder, photos for the triduum and Easter Sunday can be submitted via the links in the sidebar. Have a blessed Triduum!